Google started its domain registrar business a few months back as a beta service. 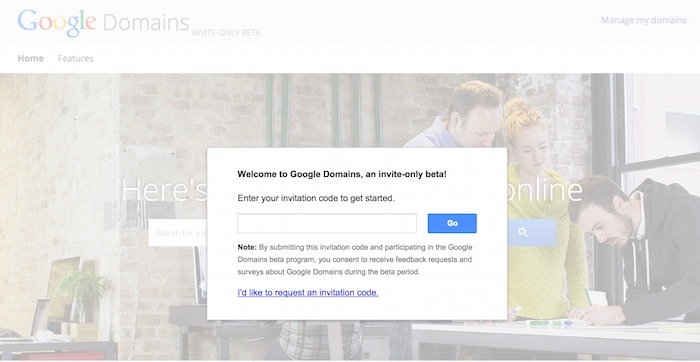 At the moment, this is still an invite-only beta and you can request an invite on the Google Domains page. The service could help small businesses get started easier as it costs just $12/year with private registration, email alias and easy integration with top website builders like Squarespace, Wix, Weebly and Shopify. After you receive the invite, you will need to set up a new domain or transfer an existing domain to Google Domains. 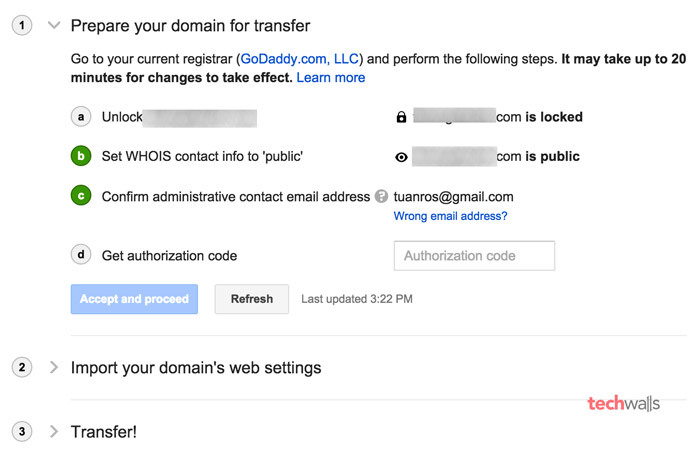 In this tutorial, I’ll demonstrate how to transfer a domain from GoDaddy to Google Domains. 1. Go to Google Domains and enter your invitation code. 2. You will see the Dashboard like below, click on Transfer and enter your domain name. 3. Next, you will have to prepare your domain for transfer. Basically, there are 4 steps you have to implement, which are a) Unlock your domain, b) Set Whois contact info to public, c) Confirm administrative contact email address and d) Get authorization code. As the b) and c) steps are already done, I will just need to unlock domain and get authorization code. 4. 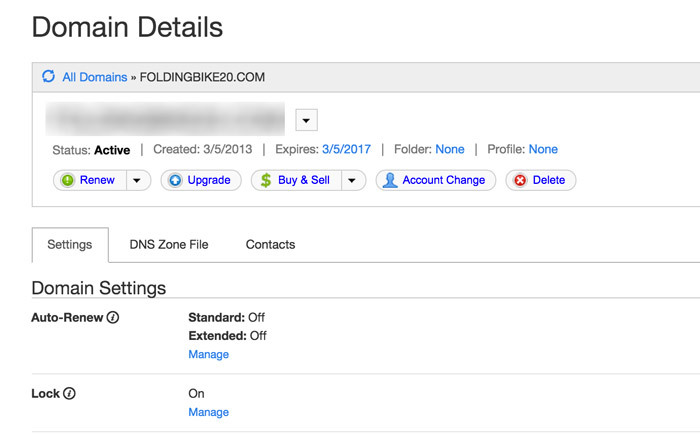 Go to your domain manager on Godaddy, you can see the Lock option under Settings. It is currently on, just click on the Manage link right below to disable it. Then, scroll down to the Authorization Code section and click on Email my code. You should receive the code immediately to your email. Now come back to Google Domains and paste the code into the text box Authorization code. Click on Refresh and then Accept and proceed button. 5. 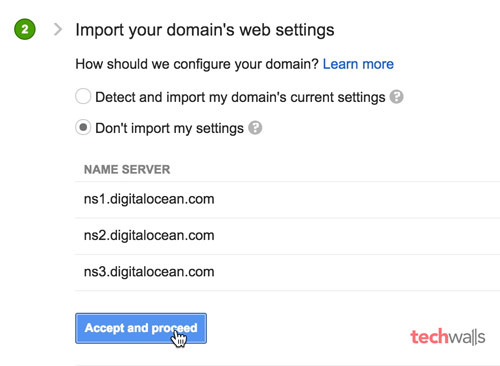 In this step, you will be asked to import your domain’s web settings, you can choose between “Detect and import my domain’s current settings” and “Don’t import my settings”. If you choose the first option, Google will import your domain’s existing resource records and update your name servers. You should choose this option if your name servers are hosted with your current registrar, if you don’t use a third-party DNS provider, or if you aren’t sure. If you host your website elsewhere, you must select the 2nd option as it will leave your domain’s name servers as they are now. Click on Accept and proceed. 6. In the step, you need to click on transfer, fill in your information and make the purchase. Transferring a domain to Google will require an additional year of registration and you have to pay $12 to continue. Google will send you an authorization email, you’ll just need to look for it and click on the Confirm transfer button in the email. Everything is done, now just wait for a couple of days for the process to be completed. This is great service. I’m curious to see how popular it will be and if it will hold any kind of ranking bonus.